UNDER THE RADAR ARCHIE #655 When a flying saucer crash-lands in Riverdale, Archie and Jughead come face-to-face with the one and only Cosmo the Merry Martian! His now-damaged spaceship is threatening to make him late for a very important meeting at the Diner at the Center of the Universe, and without Cosmo there, the fate of the entire galaxy could be at risk! Cosmic action written by a Fantastic Four great! (W) Tom DeFalco (A) Fernando Ruiz and various. What do you think? 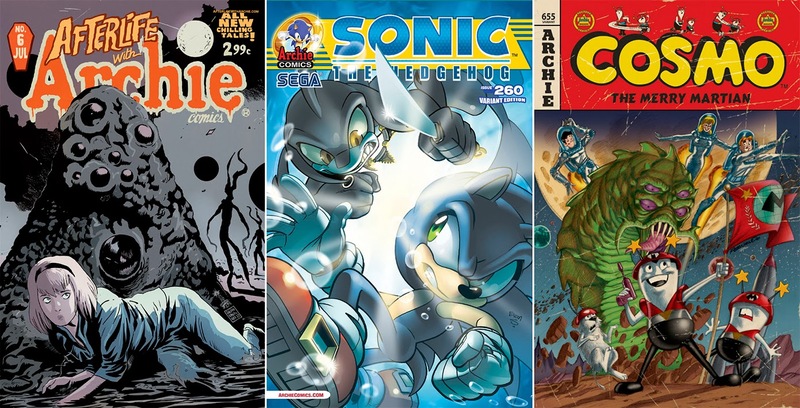 For Archie Comics' full April 2014 solicitations, click the jump!